Arrow Electronics, Inc. has acquired Shared Technologies Inc., a leading provider of unified communications and managed services. Shared sells, installs, and maintains communications solutions, including the latest in unified communications, voice and data technologies, contact center, network security, and traditional telephony. 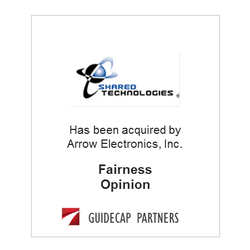 ​GuideCap issued a fairness opinion to the board of directors of Shared Technologies, Inc.